Thank you for making Total Access Analyzer the most popular Microsoft Access add-in program of all time. 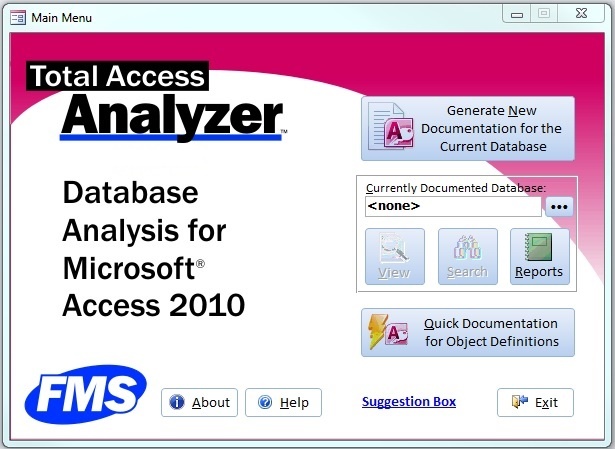 With the release of Total Access Analyzer for Microsoft Access 2019, we've created an update for Total Access Analyzer for Microsoft Access 2010. Version 14.6 replaces 14.5 and includes new features and improvements based on our experiences and customer feedback. Form and report blueprints are enhanced to capture very large reports (up to 22 inches), complicated designs with large number of controls, ActiveX controls, and layouts with many groupings. Our SQL parser detects more references to tables, queries, fields and controls across your database objects. Referenced objects are checked to see if they exist. References to subform controls by parent forms, and references by subform controls to underlying fields and controls are analyzed, documented and verified to exist. Very large databases sometimes caused Access to run out of memory during the documentation process. Errors like "Cannot open any more databases" would appear. These problems are minimized in the latest version. Data macros, introduced in Access 2010, are documented including cross-references to the underlying tables. Even though workgroup security is part of MDB databases, if your ACCDB was converted from an MDB database that has workgroup security, those settings remain. Total Access Analyzer now documents them in ACCDBs. Documenting the same database or multiple databases without exiting Access is improved, along with loading previously generated documentation. The Bracketed and Formatted VBA Module Printout report displays the loops and logic blocks of your VBA module code. The bracket lines are now thicker to appear more clearly in preview and print. More information is shown while documentation is occurring. For instance, the current control number and the total number of controls is displayed. Fonts were also increased on many screens to make them easier to read. Updated manual and help file with detailed documentation of how the program works and how to best use it. Due to the differences within each version of Microsoft Access, there is a separate version of Total Access Analyzer for each version of Access.